Directed in 1927 by Germaine DULAC and scripted by Antonin Artaud, The Seashell and the Clergyman is generally considered to be the first Surrealist film: a key element of French cultural heritage. 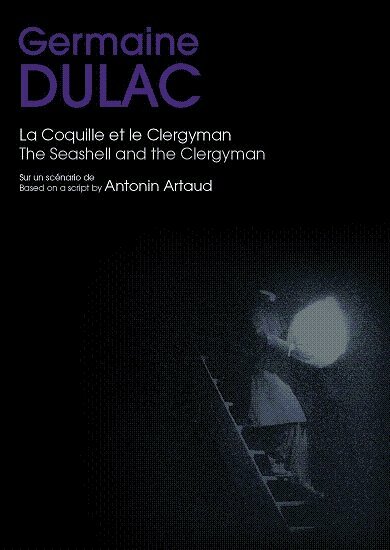 This box set is all the more welcome for the fact that thDirected in 1927 by Germaine Dulac and scripted by Antonin Artaud, The Seashell and the Clergyman is generally considered to be the first Surrealist film: a key element of French cultural heritage. This box set is all the more welcome for the fact that the film has been hitherto unavailable to the French public on DVD. A number of additional bonus tracks throw light upon various different aspects of the film (aesthetic, technical, economic). • The film in its original silent version, restored by the Nederlands Filmmuseum in collaboration with Light Cone. • Three musical versions composed by Pascal Comelade, Thomas Köner and Iris ter Schiphorst. • Two extras conceived by Nicolas Droin and Prosper Hillairet, with contributions from Artaud and Dulac experts: Tumulte aux Ursulines (Uproar in the Ursulines, 2008, 15 mins) and Surimpressions (Superimpositions, 2009, 33 mins). • A new and revised edition (160 pages) of the seminal book by Alain and Odette Virmaux published by Paris Experimental (1999). • Germaine DULAC's biography and filmography. • An account of the restoration of the film: Catherine Cormon, director of restoration at the Nederlands Filmmuseum, retraces the history of the different versions of the film and of the restoration process. This bilingual (French-English) box set with a DVD and a book is an indispensable resource not only for researchers and students but also for enthusiasts who want to learn more about the film. It offers the possibility to rediscover Germaine DULAC's famous film in its restored version while it facilitates comprehension of this avant-garde masterpiece thanks to the perspectives opened up by the various artistic and theoretic contributions of the participants.